In China, rent seeking has been linked to the idea of the local developmental state in which rapid economic development is explained in terms of the promotion of village and township enterprises by local cadres who wants to maximize revenue. At the same time, the rent-seeking state is also seen as the root of corrupt practices and in the creation of a political market where state assets and authorities are diverted into private interests. 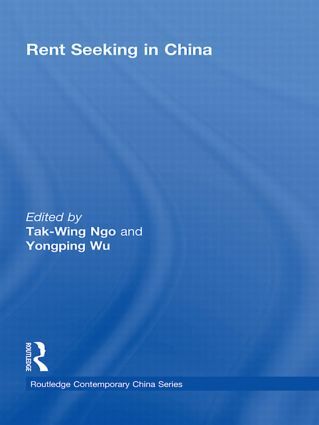 Despite the prevalence of rent seeking practices in present day China, no systematic study of the phenomenon across different regions and economic sectors has yet been undertaken and as such what accounts for the occurrence of the phenomenon, what range of activities are related to rent seeking practices and, more importantly, how rent seeking shapes political and economic development are barely understood. Rent Seeking in China seeks to address these questions using case studies from across economics sectors including primary industry, strategic industry, heavy industry, and light industry. It will be invaluable reading for students and scholars of Chinese politics, comparative politics and Chinese economic and business management.